Congratulations to Professor David Wilkinson on receiving the 2014 Grove Medal award. The award ceremony took place on April 3. 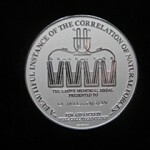 The Grove Medal is a distinction awarded to those that have made valuable contributions towards the development and success of fuel cell technology. Candidates for the Grove Medal award are selected and voted for by the Grove steering committee and presented with the Medal at the Grove Fuel Cell Event. Dr. David P. Wilkinson received his B.A.Sc. Degree in Chemical Engineering from the University of British Columbia (UBC) in 1978 and his Ph.D. degree in Chemistry from the University of Ottawa in 1987. He has over 20 years of industrial experience in the areas of fuel cells and advanced lithium batteries. Since 2004 Dr. Wilkinson has been a Tier 1 Canada Research Chair in Clean Energy and Fuel Cells in the Department of Chemical and Biological Engineering at the University of British Columbia. He also maintained a joint appointment with the National Research Council Institute for Fuel Cell Innovation for several years where he was a Principal Research Officer and a senior advisor. In addition to being a Professor at UBC, Dr. Wilkinson was the Director of the UBC Clean Energy Research Center (CERC) for the last four years. Prior to his university appointment Dr. Wilkinson was the Director, and then Vice President of Research at Ballard Power Systems Inc., involved with the research, development and application of fuel cell technology. Prior to joining Ballard in 1990 he was the group leader for chemistry and electrochemistry at Moli Energy, and part of the team that developed the world’s first commercial rechargeable lithium AA battery. Dr. Wilkinson has received a number of awards for his work including the R.A. McLachlan Award, the highest award for professional engineering in British Columbia, the Electrochemical Society Battery Division Technology Award, and a Lifetime Achievement Award from the Canadian Hydrogen and Fuel Cells Association . Dr. Wilkinson’s main research interests are in electrochemical and photochemical power devices and processes to create clean and sustainable energy. He has over 75 patents and 145 publications covering innovative research in these fields. Following receipt of the Grove medal on Thursday 3rd April 2014, Professor Wilkinson delivered the Grove Medal Lecture and formally opened the conference programme.